I honestly had no idea what to expect. Cardamom and Lime – Recipes from the Arabian Gulf was going to be a revelation and it turned out to be a stunning and fascinating one. I feel sure that the majority of us have no notion of Arabian food. But when one takes the time to look at the history of the region and its social make up all the clues are there. It’s an area that includes Bahrain, Oman, Kuwait, Qatar, The United Arab Emirates and Saudi Arabia. They are collectively known by the romantic sounding name of al-Khaleej. The pre-oil era saw a population living mainly on dates and dairy products. Sounds like a meagre diet but one that is said to be healthy. Income was from either pearling (diving for the precious gems of the deep) or trade which bought a more varied choice of foods. The food of the Gulf is considered to be, these days, a combination of Indian, Persian and Turkish dishes. Those three cuisines are acknowledged to be amongst the world’s classics. There are plenty of rice dishes but the one I find uniquely representative of Gulf cuisine is Date-Sweetened Rice, Muhammar. This is seriously sweet from date syrup (dibs – look in Middle Eastern food stores) but honey could be used as a substitute. It was traditionally eaten by pearl divers and served with fish but on special occasions roast lamb. Bengali Potato “Chops” are a popular transplant. These are tempting balls of potato filled with seasoned minced lamb or beef. They are coated with breadcrumbs and fried to give a crunchy and delicious snack. Breaded Chicken Kebabs, Kaba Diyay, could be served with tea, as tasty finger food or as a starter with salads. Minced chicken is seasoned with cumin and turmeric, onions and fresh coriander. The mix is then rolled into sausage shapes, coated with egg and breadcrumbs and fried. Shordat ‘Adas or Shorbat al-dal is perhaps the most celebrated of Gulf soups. Although there are versions that are popular in India, this one has the local addition of the ubiquitous dried limes, lumi, to give a regional twist. It’s often served at Ramadhan where it is a welcome meal for those breaking the day’s fast. Gaimat are crunchy balls of dough in a sweet saffron syrup. This decadent dessert is best avoided by those with an eye on an expanding waist-line …OK, just have a few. These would go well with an glass of mint tea in the afternoon, or at any time. They are moreish and irresistible. 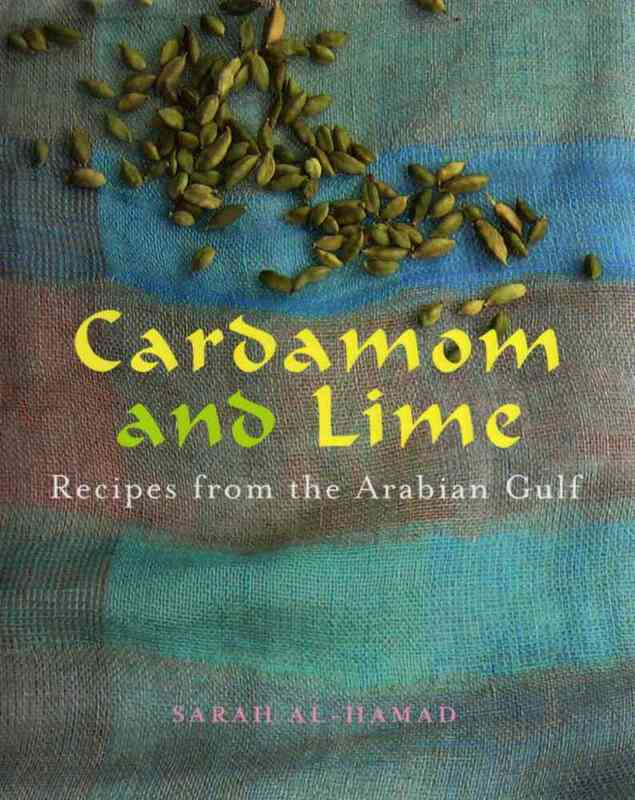 Cardamom and Lime is part cookbook and part travelogue. The photography by the author Sarah al-Hamad offers an invitation to the reader to enjoy fine regional fare and a culture which is both rich and romantic.